Theatrical intervention based on the work based on the work Desire caught by the tail by Pablo Picasso, in the exhibition of a thing and Pol López as well. Put the head in the appetite like the cow wets its snout into a Com and satiates itself, the fat and very precious one. (A 'Com' is what is known as a drinking trough in Catalan). How good it is that there are some parentheses in this text; it makes you want to take them and use them as toothpicks (which in Greek are called odontoglyphs) and chop all these letters and eat them, swallow them all like a whale would gush down a porró full of plankton. Hunger, cold, desire ... Pol López faces the Picassian universe of the fleshy poetry of the theatrical work Desire caught by the tail and gives us an interpretation right in the middle of the exhibition «Picasso's Kitchen». 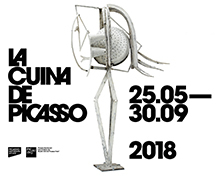 In this intervention, which is an interference as well as a contribution to the exhibition, Picasso's words take on the value of a pictorial work and his visual universe is translated into sound and gesture.